Sean Astin earned his first payday at the age of nine, starring in an after school special, Please Don't Hit Me, Mom with his famous mother, Patty Duke. At 13, he starred in The Goonies with Josh Brolin and Corey Feldman. He later starred in the underrated action film Toy Soldiers, in Encino Man with Pauly Shore and Brendan Fraser, and earned good reviews as the shrimp too small to play football for Notre Dame in Rudy. Austin was nominated for an Oscar in 1995, not as an actor but for a short film he directed and produced with his wife, Kangaroo Court, starring Gregory Hines. 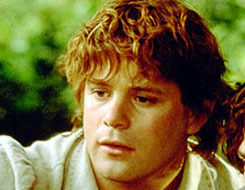 After that, though, Astin spent several years playing small roles in half-remembered films and large roles in forgotten films, before being cast as Samwise Gamgee, a hobbit in Peter Jackson's Lord of the Rings films. Astin has directed a few other short films, and he borrowed equipment on the Rings set to make the oddly heartwarming The Long and Short of It. He wrote the non-fiction There and Back Again, chronicling his time on the Lord of the Rings movies, from auditioning for the first film to watching the final film win all its Oscars. After the huge success of the Lord of the Rings films, Astin and Elijah Wood appeared on New Zealand postage stamps, but due to a typographical error, Astin's name was misspelled 'Austin' on all the stamps. He played Mister Smith on Jeremiah with Luke Perry and Malcolm-Jamal Warner, and took a recurring role as a doomed counter-terror agent on 24 with Kiefer Sutherland. Astin says he has a strong interest in politics, and has hinted that he might eventually jettison show business for a try at elected office. He has not hinted much, however, about what his politics might be.